Written by Mariah Neilson. Photo by Maggie Langdon. Mother Teresa is an iconic figure of what sacrificial, servanthood looks like. Even she recognized that it was not her love and her service but God’s through her. At first, I assumed God would give me strength and that his love would show through me automatically, and that I wouldn’t need to seek Him. While reading Finding Calcutta by Mary Poplin, I became excited for this awe-inspiring rush of God’s love to fill me and pour out of my work. Did you catch that? My work. This things I was going to do. The diapers I would change. The mouths I would feed. The good deeds I would do. It was going to be about what I would bring to offer. On my first day of serving, I was handed a baby boy, who was about a year old. He was unresponsive to words or touch, but his eyes scanned the roof and never made eye contact. 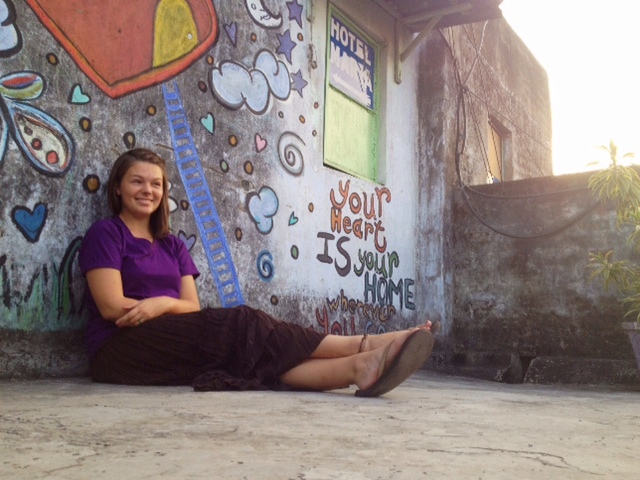 After prayer, the volunteers sang Jesus Loves You to the children and listened to worship music. I rocked the little boy I was holding and I prayed that God would help me love this boy. I prayed that God would be the one serving, not I. After 45 minutes his hands began to reach for mine and squeeze them slightly. I had prayed that God would show this little boy how much he was loved. And I believe God did. It was amazing to see God’s love everywhere I looked. I completely believe that it is because the sisters are continually in prayer with each child or person they serve. They ask God how he wants to love the person they are focused on. God worked through my disobedience, He worked through my wandering heart. But it does not give me the right to justify walking away from His presence and expecting God to still work. The first day of serving I was at Nirmal Hriday also known as Kalighat, the Mother Teresa house for the destitute and dying. I was guided by one of the sisters into a seat next to an older woman with buzzed-cut gray hair, smooth brown wrinkly skin, black and pink streaked nail-polished fingers and was a little chunkier than many others. I called her Didi, sister in Hindi. I helped her with arm exercises, smiled at her a lot and talked to her. She got tired of the exercises and the weight of her hand and arm were now placed on my left knee. Her friend across from us moaned and struggled to avoid pain. In that moment of seeing her friend struggle, she trusted the weight of her pain onto me. She squeezed my hand tightly and shifted much of her weight onto me. She relied on me that I would support her and not let go. I learned that the best thing I could do as her friend yelled and cried was to love her by squeezing back, smiling and speaking words of encouragement. I let God work through me. He allowed me to love on her and stay strong for her, as He held me up as I held her up. Without His grace and presence I would have been lost. I would have expressed the sorrow I felt for her. India can be a very overwhelming place. The noises, smells, sights, crowds, and even the flavors of food are very vivid and unique, and sometimes you just don’t quite know what to make of it. Trent and Josh go for a stroll on Park Street and describe what they see on the team’s first day in India. 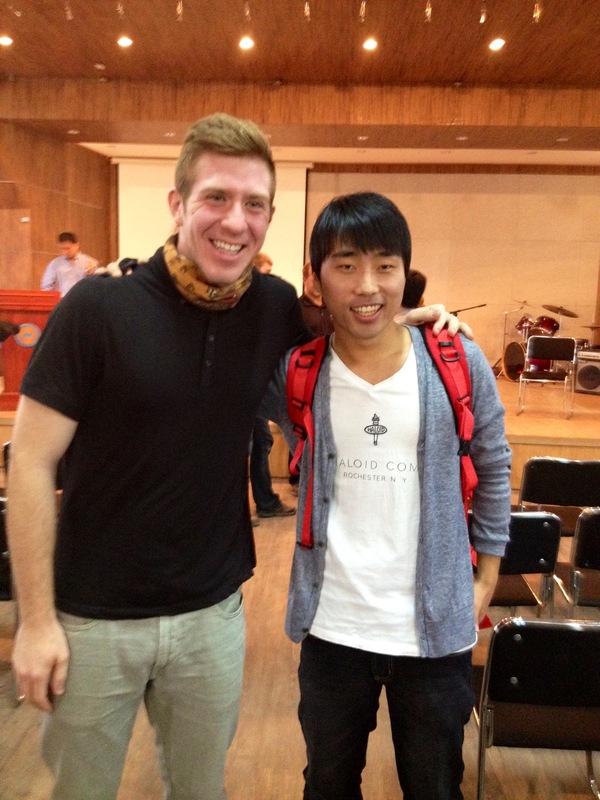 I stuck my arm underneath the right arm of the Indian man and lifted. My friend Jim did the same on his other side. The man let out a loud scream and dug his nails into my arm then bit me. I grimaced, but continued to tug and pull on the man, all while he kicked and yelled. Our objective was to move this man from where he was sitting, the laundry area, into the restroom/shower area. 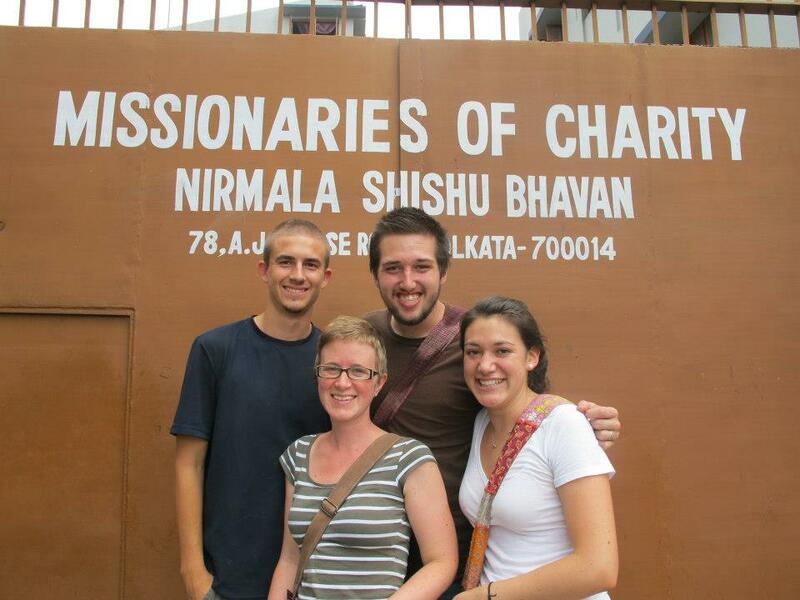 I was serving at Kalighat, a home of Mother Theresa’s, where the destitute and dying lay. This man, who had just arrived an hour ago, was neither dead nor dying. In fact, this man was very active as he continued yelling and grabbing hold of various objects to further prevent my friend and me from getting him to his destination. We finally got him into the restroom and pushed him to the floor. Sister Florentine arrived. She reached down and grabbed the man’s shirt collar. She then tore the shirt right down the middle; a button flew off and hit me in the chest. He tried to crawl away but this only worked as a disadvantage as she used the momentum to help pull off his pants and undergarments. She took a bottle of soap and poured it over top his head, immediately followed by a bucket of water. There he sat, naked and wet, his ripped clothes on either side. She then began her work on his wrapped foot. She began unwinding the layers of the bandage. I finally understood why we were so intent on getting him care. His foot fully exposed, revealed a gruesome sight. She took a bar of soap and began scrubbing directly onto the bone. 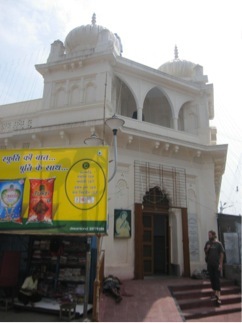 I was frozen as I watched what appeared to be a nun torturing a naked Indian man. I can’t recall the last time I missed an entire football season. Traveling on the Around-the-World Semester® II means that there will be one less Steeler fan watching this winter. Ever since I was a little girl, I grew up in Steeler country watching football with my dad, uncles, and brother every Sunday. Not to mention, every summer the Steelers bombard our little town of Latrobe, PA and host their training camp at St. Vincent College right near my house. 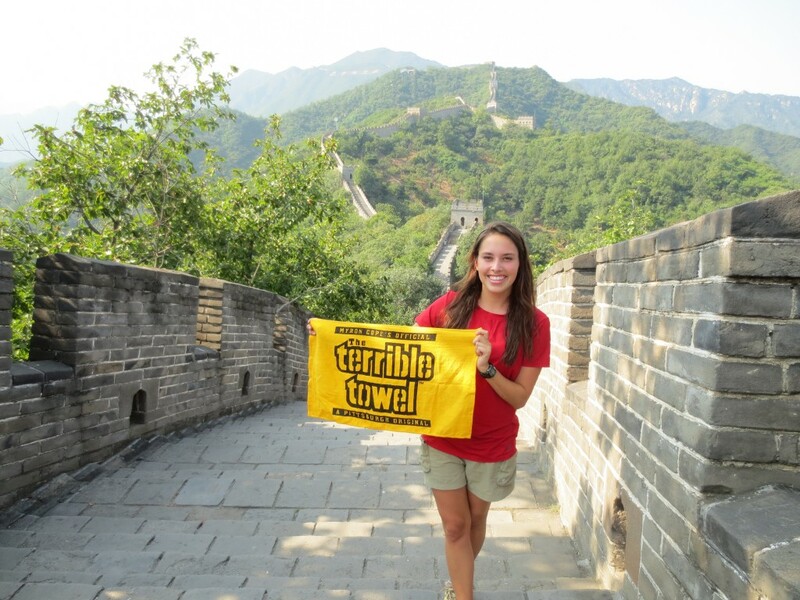 It’s a Pittsburgh tradition that anytime you travel internationally, you take a picture with your terrible towel. This tradition is a reminder that even though you are far away from home, Steeler nation is represented wherever you go. Traveling with my terrible towel in my daypack, I am constantly reminded of my home culture, memories, and where I come from. 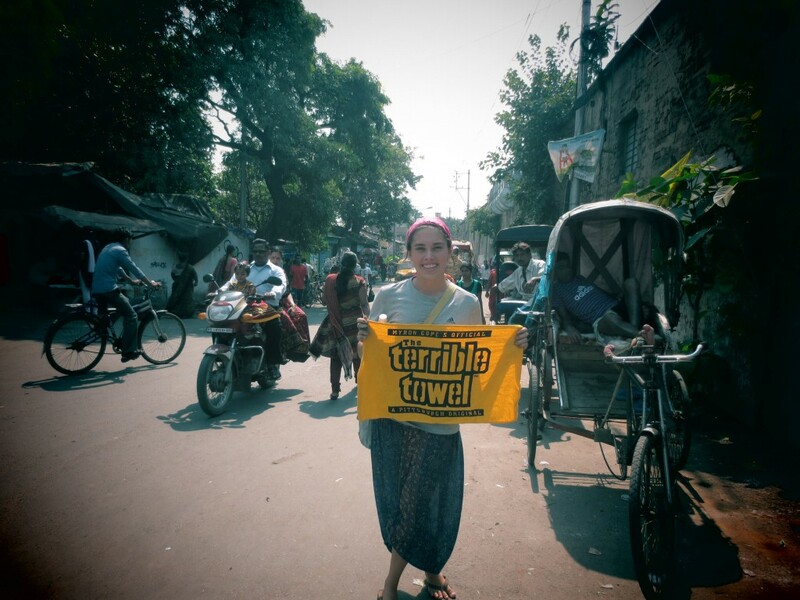 Being a Steelers fan is a part of me that cannot be removed and I am proud to carry the towel on this trip. So far, the towel has been hoisted above a ger in Mongolia, above the Great Wall of China, on top a boat in Ha Long Bay Vietnam, on the beach in Thailand, in the slums of India, in front of an obelisk Ethiopia, at a palace in Slovakia, and many more to come. God has blessed me with this trip in serving him, and I am forever grateful to be trekking around the world with this community, towel in hand.